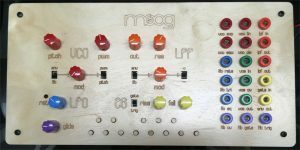 I got some Moog Werkstatt synthesizers so that I could play with analog synthesizer circuits. Here is a summary of modifications I made to them. JMP 57 to disconnect the VCO and VCF. JMP 58 to disconnect the VCF and VCA. trim potentiometer VR10 to disconnect the keyboard and VCO. I added an expansion board to buffer signals and adjust the levels to my liking. Here are the schematics. Some of the ideas came from the synthnerd blog, in particular, the proper gate input. I connected all the resulting patch points to banana plugs. I added 1900 Davies Style knobs with the metal insert. They are a little bit larger than the potentiometer shafts, so they sit a bit off center. It’s not that noticeable. Since I broke out both waveforms for the VCO and LFO, I trimmed the selector switches using a dremel so that they would fit beneath my custom case. The case is 1/8″ birch plywood laser cut by Ponoko. The Inkscape design file can be purchased here for a small fee.